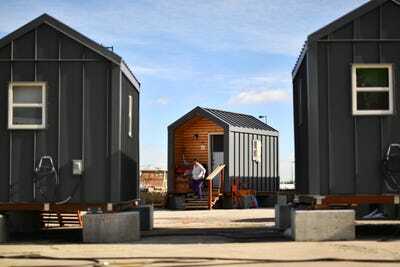 Hyoung Chang/MediaNews Group/The Denver Post/Getty ImagesA tiny home village in Denver, Colorado. San Jose, California recently secured approval to build two tiny home “villages” for the homeless. The project is one of many proposed solutions to the city’s housing shortage, which has led to thousands of residents sleeping on the streets each night. On any given night in San Jose, California, it’s possible to encounter homeless residents sleeping beneath highway underpasses or in large, tented encampments mere blocks away from some of the wealthiest neighbourhoods in the US. As the largest city in Silicon Valley, San Jose has an estimated 4,300 homeless residents – a number that swells to around 7,000 people for the entire Santa Clara County. 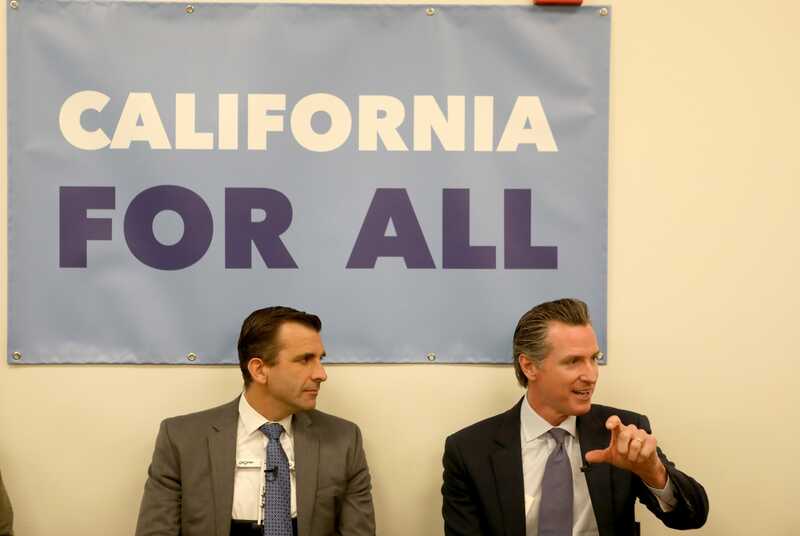 Anda Chu/MediaNews Group/The Mercury News/Getty ImagesCalifornia Governor Gavin Newsom, right, alongside San Jose Mayor Sam Liccardo, left, host a roundtable about the state’s 2019 housing crisis in San Jose. When San Jose first proposed building villages for homeless residents, it estimated that each home would cost around $US18,000. The approved project cut that price to $US6,500 per unit. Each home will be incredibly small – just 80-square-feet, or 120 square feet for those who are differently abled – but they come with their own electric outlets, smoke detectors, and locked doors. Residents will share showers, bathrooms, and laundry facilities. The city refers to the project as “interim housing” – a temporary way to transition homeless people to a permanent residence. To discourage residents from staying too long, San Jose will charge a small rent of either $US20 for the unemployed, or 10% of a person’s income for employed residents. After six months, the rent will go up by 10%. 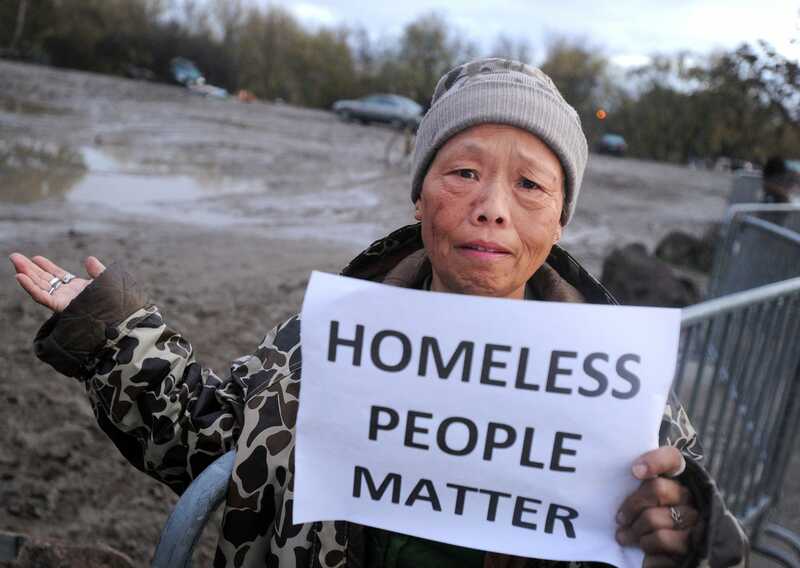 Josh Edelson/AFP/Getty ImagesMercy Wong protests at a Silicon Valley homeless encampment known as The Jungle on December 4, 2014, in San Jose, California. But other tech industry cities like Seattle, Boston, and Los Angeles have faced similar housing crunches. And, like San Jose, they have turned to tiny homes as a way to address the problem. In November 2017, Boston launched an 18-month pilot program across three neighbourhoods to study the effect of ADUs on affordable housing. Around the same time, a nonprofit organisation in Seattle began building 125-square-foot units in the city’s Beacon Hill neighbourhood. More recently, the LA County Board of Supervisors set aside $US550,000 for an ADU pilot program for homeless tenants.